With more than 11 years of experience in supplying steel and processing steel building, QH Plus always focus on the improvement of product and service quality to bring more customer benefit. Apart from investing on modern machine technology and renovating new solutions to accelerate the progress and efficiency, QH Plus also focuses on building favorable environment for each individual staff and each department to develop and express their qualifications. 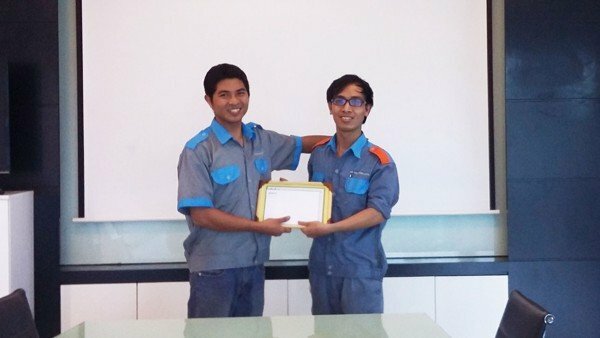 Recently, QH Plus Industrial Joint Stock Company (QHPI) – a member of QH Plus system has awarded on improvement activities for Mr. Le Van Niem – Maintaince Executive, Technical Department for advancing Steel Bending Forming Machine. For a short period of time (6 days), the research and improvement has brought many great results. The success of upgrading Steel Bending Forming Machine has brought many benefits to QH Plus Industrial Joint Stock Company, such as: automatic production, reducing labor, increasing productivity, saving time and production cost. In addition, the improvements also help minimize problems and being the prerequisites for developing next PLC programs for other devices to meet customer’s requirement and future market trend.